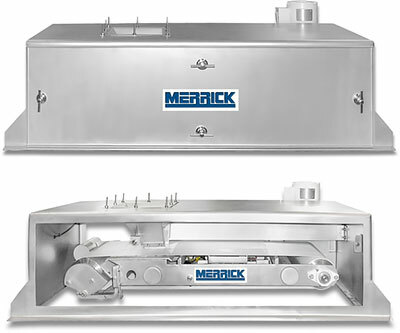 Model 970I | Weigh Belt Feeder | MERRICK Industries, Inc. The Model 970I Industrial Weigh Belt Feeder has a 12”, 20” and a 24” belt that is designed to meter various materials into a process at a designed feedrate with gravimetric precision. The feeder belt speed is varied to deliver material from a supply device into a process at a desired rate. A weight signal output and speed signal output are supplied for closed-loop process control.